What all the various recipes have in common is that the materials that you have chosen are ecological, resistant to fire and water, they insulate you from the heat, cold and noise and they regulate the humidity of the living space, as well as being ideal for use in earthquake-proof constructions. In certain cases they are made of completely natural materials. Other recipes allow you to contribute to improving the environment and your quality of life, because they use waste from the industrial production which is recycled in inert substances that are non-harmful for man and the environment and reused in a virtuous cycle of the recycling economy. All these materials are oil free, therefore completely independent of the oil production process and are formaldehyde-free. This small miracle is taking place at CMF Greentech, in Cavezzo, close to Modena. The company is part of CMF Technology SpA in Pavullo, which has produced systems and machinery as well as automation for the ceramics industry for 40 years. It all began in 2008 when the CMF management decided to start a green project. The objective given to the researchers was simple and at the same time huge: “finding totally ecological materials and production process”. Much is due to fine tuning the “royal jelly”, an ecological binder used to create a material, which is subsequently transformed in panels, by amalgamating natural products as well as industrial waste. This inspired the idea of creating a system for producing materials for green housing and interior design in Cavezzo, one of the hardest hit towns by the May 2012 earthquake. The plant was officially inaugurated in November 2016. Currently the low emission production counts on five employees and it has been designed to guarantee sustainable energy and to protect the local territory. Thanks to the high level of automation the whole production cycle could be managed by remote control. CMF Greentech has two divisions: Greenbuilding produces materials for green housing and Greendesign that creates and promotes materials used to produce natural, sustainable and highly striking furniture and interior design. A visit to the CMF Greentech plant is like taking a journey to the near future. The process begins with an external hopper that serves five silos, where the materials used in the process are stored. From the silos the hemp, wheat, industrial production waste and everything that the “chef” can think of are automatically sent to be mixed with the royal jelly. The product is laid on rollers that feed the panels to the presses and then the drying unit. The unfinished panel is then sent to a cell for calibration, sanding and squaring, which is where the SCM technology comes in. The totally integrated cell which operates without operators, is assisted by handling systems created specifically by CMF. 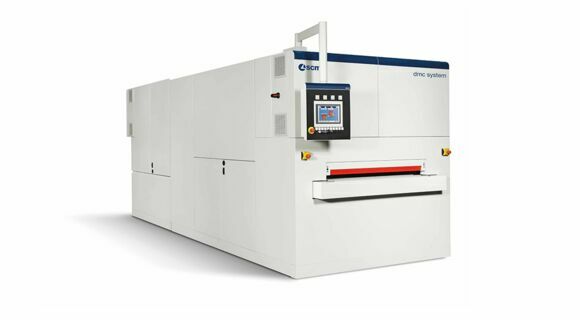 The first part of the SCM cell is produced by DMC System, the heavy duty work centre for calibrating and sanding, in a single passage, both sides of the panels with a width up to 2200 mm. The machine has three upper and lower roller machining units. The first two units perform large stock removals and machine the panel to the desired thickness with the grooved steel roller and the high power motors, up to 75 kw per unit. The third unit sands and finishes the surface of the panel. DMC System, thanks to a highly technological modular structure, allows for the installation of a fourth machining unit, to allow the machine to be aligned to the changing production requirements and to maintain the machine composition up to date. After this phase the panel is fed to the second part of the SCM cell which squares the panel. It consists of a first Celaschi Progress 60 squaring unit, that defines two sides of the panel. 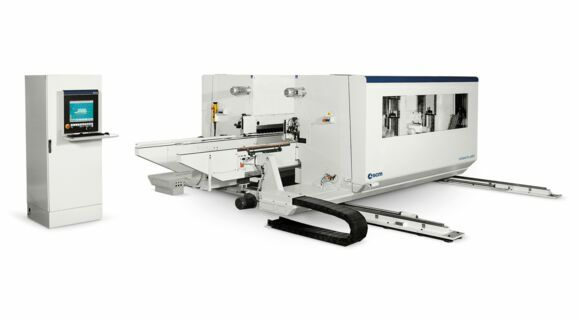 A semi-circular handling unit inserts the panel in the second Celaschi Progress 60 squaring unit which completes the machining operations on the other two sides. At this stage the panel is ready for further machining operations or to be laid. The SCM service, based on highly technological products, guarantees production reliability and finished elements with a high level of quality. The geometric precision ensures easy and perfect assemblies, whilst the surface finish ensures exceptional aesthetics and a highly innovative product. 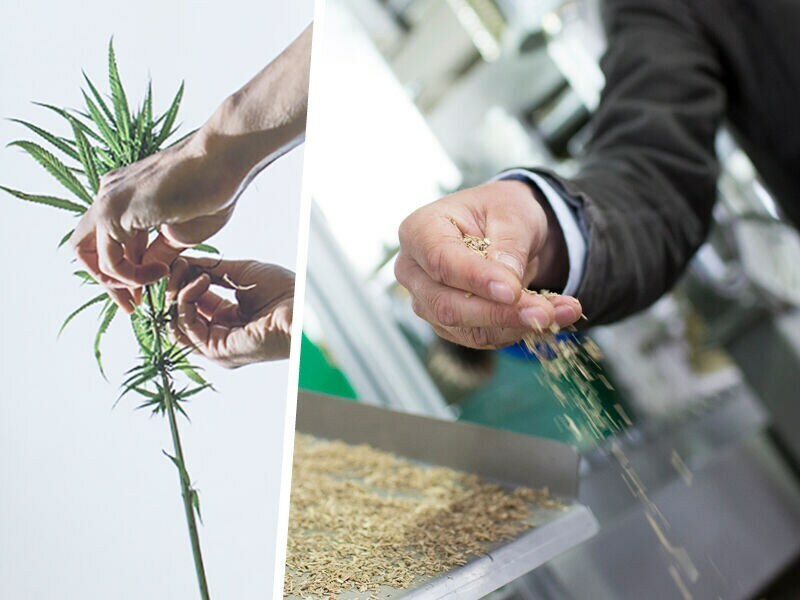 CMF Greentech currently produces at the industrial level five types of panels, four with hemp biomass and one with fir vegetable flour. But as we said earlier, the possibilities are infinite. The range of products includes CANAPAlithos panels, of various densities and thicknesses, produced with hemp or hemp mixed with other materials. Hemp is a very easy crop, which was once typical of this area, with exceptional specifications and totally green. The other advantage of the CANAPAlithos panels is that they are very quick to install. A very common combination used for the panels is a mixture of hemp and clay, another material that has always historically been used for constructions and that adds further positive specifications to the panels. Greentech produces panels called EKOlithos, which use materials from different industrial production processes. The most popular material at the moment is a fir vegetable flour, but in this sector there are enormous possibilities. The Greentech technology has already shown that it can use different biomasses: wheat straw, rice chaff, maize, olive stone, as well machining waste or sub product debris such as polyurethane dust from scrapping fridges, ceramic production waste, paper mill sludge, fibreglass, mineral waste such as quartz, even small parts of PVC from cables that protect copper wires, which are used as striking decorative elements in the panels. We are currently researching an extremely interesting waste management project with an important company of the sector, to create panels out of coffee grounds to furnish the shops of the chain. 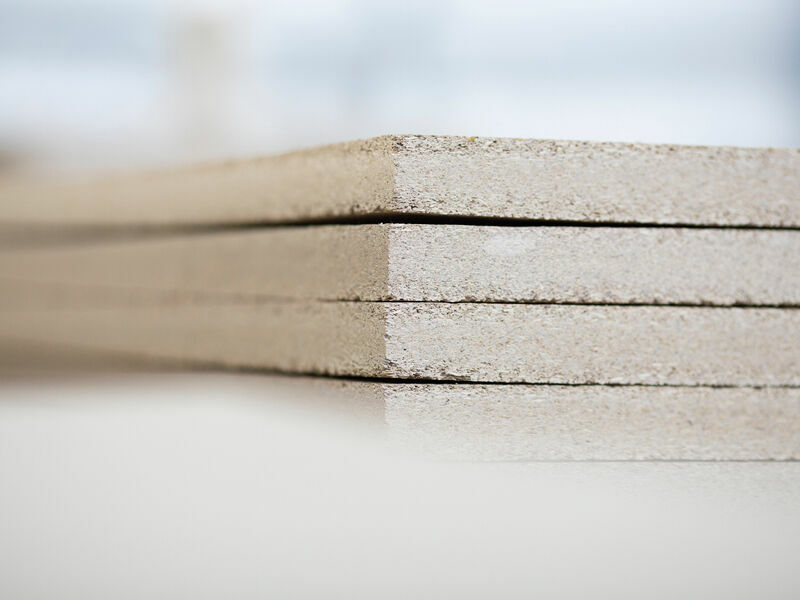 These panels, as opposed to the hemp and hemp-clay panels, can be produced at high densities and provide an alternative to HPL plastic laminate panels. CMF Greentech is also extremely focused on the aesthetic, sensorial and tactile aspect of its production. Many products are available in coloured versions to broaden the palette for designers. Ecological products, materials with a soul, recycling, sustainability, technology, automation and digital interaction: key words of the future, but which are already the present of CMF Greentech.